Motherboards are ultimately designed to appeal to the market that offers a peak return for the motherboard manufacturers, both for cost and unit sales. The design of that appeal comes down to feature set, intended market, style, accessories, and with any luck, a clear execution. MSI's Gaming Pro Carbon range has been at the front of the company's recent push to appeal to the high-end enthusiast that wants a clean look, a strong feature list, but also the ability to bling it up when they want to show off the system. Beauty, they say, is in the eye of the beholder, so we ran it through our system level tests to see if the system shines under the hood. The base quality of motherboards in 2018 means that there has to be significant substance underneath the style. Overall, the performance testing went quite well. The X299M Gaming Pro Carbon AC performs close to the larger ATX models, but for one reason or another the aggressive multi-core enhancements (MCE) we saw on when testing their other boards did not make it down here. With that, the power consumption of the X299M was in line with many of the other boards that are not as aggressive on the MCE tweaks. Boot times were on the slower side of things compared to the rest of the boards, but it was on par with the two other MSI boards which we have tested. Overclocking results were also the same, topping out at 4.6 GHz and being temperature limited. On the feature front, the most obvious visual is that this motherboard only has support for one memory module per channel, limiting the total memory to 64 GB. Aside from the one disadvantage of a reduction in peak capacity, this usually affords benefits by making tracing easier and supporting higher speed memory (when overclocking). Another feature not so obvious is that this motherboard is listed to only support Skylake-X processors, and not the quad-core Kaby Lake-X processors. This is also likely to make the design easier, especially when dealing with PCIe lanes for storage and physical PCIe slots. The MicroATX Gaming Pro Carbon AC gives users nearly all options for storage connectivity - it has two M.2 slots which share some of the bandwidth from the eight SATA ports. For the three PCIe slots, all three are connected to the CPU. So while all three can be used for video cards, the reinforced slots are the primary GPU slots. For connectivity, on the back panel we can see support up to USB 3.1, as well as Type-C, as well as the Intel 8265 Wi-Fi, dual Intel NICs, and a Realtek ALC1220 audio codec. The X299M Gaming Pro Carbon AC is currently priced at $293 from Newegg and $305 from Amazon. Its only direct competitor, the EVGA X299 Micro is, priced at $290 on Newegg. A quick glance here between these two has the MSI board with more available SATA ports, a higher-end audio codec, and more going for it. MSI's X299 XPower Gaming AC holds the current flagship position of MSI's range, and makes its home in the Enthusiast Gaming segment along with the X299 Gaming M7 ACK. At present there are a total of three boards in the Performance Gaming hierarchy, with the Arsenal line that carries the Tomahawk boards. MSI has the standard Pro lineup for more cost-effective options that have slightly fewer features. The X299M Gaming Pro Carbon AC is one of two microATX boards within MSI's lineup. The other, the X299M-A Pro, is a bit further down the product stack. MSI is the only OEM that has two MicroATX boards, while some have nothing smaller than ATX (Gigabyte and ASUS). 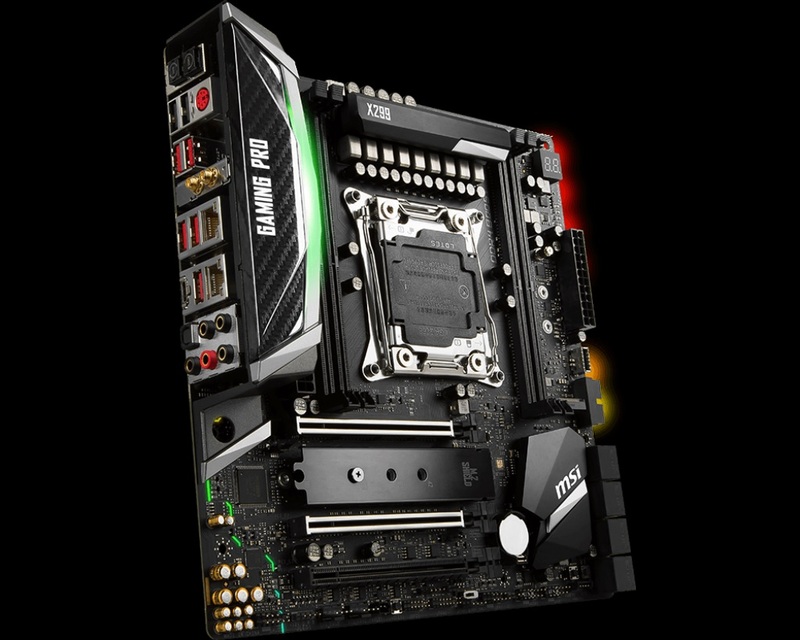 ASRock, on the other hand, offers one - a feature-laden Mini-ITX board, the X299E-ITX/ac. This means that the X299M Gaming Pro Carbon AC has only one direct competitor, the EVGA X299 Micro, which we reviewed here. 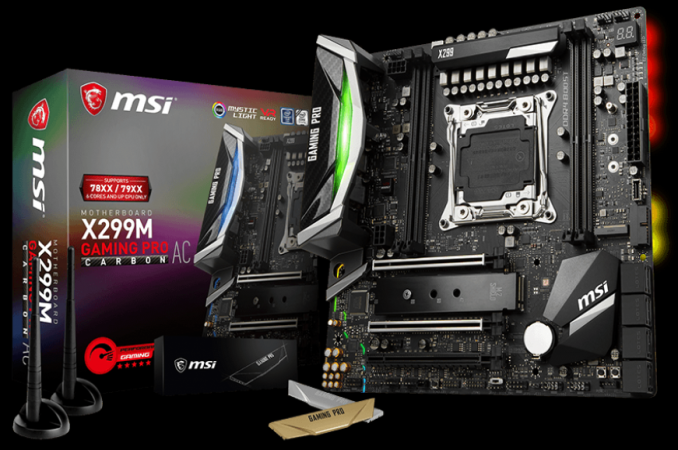 The big differences between the two MSI microATX offerings really comes down to a few things. First, the X299M-A Pro supports Kaby Lake-X CPUs only. Outside of that, the only major differences have to do with USB 3.1 (10 Gbps) support and the network. Pricing on the X299M-A Pro reflects these differences and comes in around $207 at Newegg. The X299M Gaming Pro Carbon AC, on the other hand, is able to support only Skylake-X CPUs. With that, it offers quad channel RAM through its four DIMM slots. USB 3.1 (10 Gbps) support for the front panel is found here along with dual Intel NICs and integrated Wi-Fi. This board also has integrated RGB LEDs while the X299-A Pro does not. The additional features do come with a higher price being sold for around $280 at Newegg.